The Framers of our country understood that the population of our new country would grow. They wanted to be sure that the representation for the people would remain fair. They decided that a census, taken every ten years, would suffice to determine the number of seats in the House of Representatives and the number of electors to the Electoral College. The census also keeps taxes fair, as they are to be determined by individual states as per population, not as to their property. This is all the census was designed for, as stated on the US Constitution, Article I, Section 2, Clause 3. However, the modern Federal Government, in all it’s wisdom, do not feel they have enough information about you. They want the details of your children’s education, your employment, your religion, and even what race you are. This information was never required, and should not be. The arguments go back and forth as to what the information will be used for. The government tells us that they need the information to meet the needs of the community. They assure, and reassure, us that the information will not be shared, even with other government departments. However, they said that to the Japanese before World War II, as well. All of this seems like a nice little debate at this point, however, the Census employees do not limit themselves to just the actual census, nor are they limited to every ten years. Between decades, the Census employees attempt to get folks to fill out their ‘surveys.’ These surveys are more intrusive than the actual census. They also try to bully you into believing that the responses are required by law. We know of one family that has been targeted by the Census Bureau. They get visits and calls every couple of years concerning these surveys. More recently, they have been visited by multiple census employees, just in the last two weeks. When they don’t fill it out for one person, they just send another. Now, they are sending the paperwork via FedEx. They are determined to waste as much taxpayer money as possible in this futile effort to get their personal information. It is not like the government doesn’t already know who they are. They just want more… and more… details. They have a burning need to control everything. This is just another manifestation of the Federal Government over reaching into the lives of it’s citizens. The ultimate data mining! Watch your back doors, Patriots. The Feds will come at you in every way they can. KrisAnne Hall has written a very good article explaining the need, and requirements, for the census. 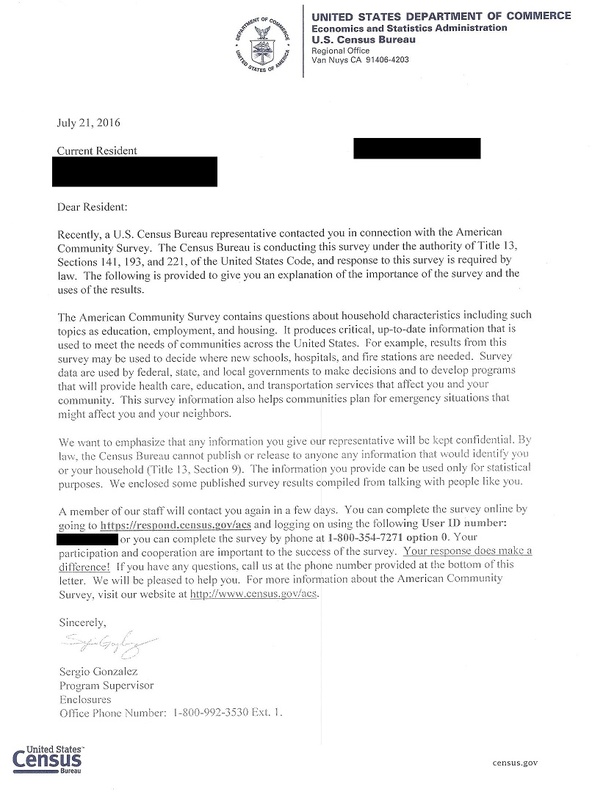 It also discusses the over reach of the modern Federal government in their quest to get these surveys completed.